When looking for a replacement disc brake kit for your trailer, Tie Down Engineering has you covered. Tie Down Engineering disc brakes are some of the most popular brakes on the boat trailer market. We feature both the Aluminum Caliper and Vented Rotor Eliminator line of disc brakes, and the G5 Line with TDE Stainless Steel Disc Brake Rotors. 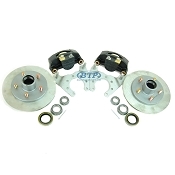 We carry these disc brake kit assemblies to outfit both 5 Lug and 6 Lug wheels. The Disc Brake Kits from TDE are common on all makes and Models of boat trailers. The 5 Lug Versions are for 3500 lb Capacity trailer axles with a 4 Hole Brake Flange. The 6 Lug versions are for 5,200 lb trailer axles with a 5 Hole Brake Flange. Tie Down Engineeering Hydraulic Disc Brakes are ideal for all types of boat trailers ,both freshwater and saltwater. They feature components made of aluminum and stainless steel ,for maximum corrosion resistance.